Heliocare 360ᴼ fluid cream is an ultra-smooth, rapidly absorbed gel suitable for all skin types. The 360ᴼ Revolution provides skin protection against the daily environmental challenges our skin faces and helps prevent the skin-ageing and damage these challenges can cause. It does this at a greater breadth and a higher level than previously possible, with products that have a skin­‐loving feel that encourage everyday use and that everyone concerned about skin-­ageing and skin-­health can incorporate into their daily skincare regime. 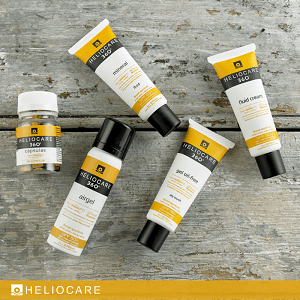 Heliocare 360ᴼ cares for the skin by ensuring users want to use it very day and by making the presentations easy to use every day. Heliocare 360ᴼ takes the renowned Heliocare skin-lovin feel and daily use compliance to another level. PROTECTION - against the complete spectrum of daily environmental challenges UVB, UVA, Infrared­‐A (IR-‐A) and visible light. Uniquely SPF50+ and broad spectrum UVB|UVA protection is combined with the Heliocare® 360° BioShield System of Fractional Biomimetic Melanin and Pro­‐Taurine providing additional advanced biological protection against high energy visible light and Infrared‐A radiation. The BioShield System absorbs high‐energy visible light at the skin’s surface and helps neutralise the action of infrared- ‐A within the skin. PREVENTION- of the damage the ROS/ free radicals generated by these daily challenges can cause using the clinically proven and patented Fernblock® Polypodium leuctomos extract contained in every Heliocare product. Fernblock® is a natural complex containing powerful polyphenol anti‐oxidants such as ferulic, caffeic and vanillic acid, supported by extensive peer review published evidence of it’s high level skin anti-­oxidant efficacy. In Heliocare 360ᴼ this is fortified with additional ferulic and caffeic acid to make Fernblock® FC, with an antioxidant activity up to 4x greater than Fernblock® alone. The Heliocare 360ᴼ antioxidant prevention effect is further enhanced by the addition of Vitamin C, E & Green tea extract. REPAIR- of DNA damage. DNA in skin cells can be damaged by it’s absorption of UV and through oxidative stress caused by ROS, this can accelerate skin­‐ageing and impair skin-‐health, in the worst case leading to skin cancer. Fernblock®FC can help reduce DNA damage and natural plant-derived DNA repair enzyme ingredients in Heliocare® 360° can help reduce the level of DNA damage. CARE- of the skin due to it’s silky smooth moisturising formulations that encourages every day use. The fluid cream, provides an advanced and Intense moisturising complex making it the ideal essential anti­‐ageing protect and prevent morning use product and the airgel is a light foaming mousse that provides smooth and even coverage and is ideal for those who don’t require a high level of moisturisation and for reapplication during periods of high exposure. Heliocare 360ᴼ fluid cream is an ultra-smooth, rapidly absorbed gel suitable for all skin types. It is non­‐comedogenic, paraben free, dermatologically tested. Delivered in sleek cosmetic packaging with a smooth dispensing nozzle it contains an advanced “fluid cream” skin hydrating and moisturising complex. Heliocare 360ᴼ fluid cream is ideal for daily morning use. Apply in the morning to complete your anti-ageing skincare regime. Gently massage until absorbed ensuring complete coverage of the face and décolleté. Non-comedogenic and water resistant reapply every 2-3 hours during periods of high sun exposure. A natural, breathable mineral formulation that leaves skin feeling luxuriously silky, with a satin glow that also makes it perfect for use under make up. Great for all skin types. An ultra-light, mattifying gel that melts quickly into the skin leaving it hydrated but dry to the touch. It’s great for all skin types, but especially those with oily or combination skin. A light cream with an advanced moisturising complex that leaves the skin feeling soft and hydrated. Great for those with normal to dry skin. A light, mousse-like formulation that conditions the skin and dries quickly, providing an even coverage. Perfect for all skin types. Aqua C12-15 Alkyl Benzoate Diethylamino Hydroxybenzoyl Hexyl Benzoate Bis-Ethylhexyloxyphenol Methoxyphenyl Triazine Diethyl ButamidoTriazone Isoamyl Laurate Emollient PPG-15 Stearyl Ether Hexylene Glycol Caprylyl Methicone Titanium Dioxide Dipropylene Glycol Dibenzoate Emollient Ethylhexyl Triazone Hectorite Trilaureth-4 Phosphate Emulsifying Ethyl Ascorbic Acid Polypodium Leucotomos Leaf Extract Ethylhexyl Ferulate Ferulic Acid Caffeic Acid Glycerin Humectant Physalis Angulata Extract Ceteareth-25 Caprylyl Glycol Melanin PPG-15 Stearyl Ether Benzoate Sodium Citrate Camelia Sinensis Extract Tocopheryl Acetate Panthenyl Triacetate Antistatic Parfum Arginine Hydroxypropylcellulose Disodium Ethylene Dicocamide PEG-15 Disulfate Ethylhexylglycerin Ethyl Linoleate Caprylic/Capric Triglyceride Oleyl Alcohol Butylene Glycol Manganese Oxide Oxothiazolidine Tocopherol Lecithin Sodium Benzoate Linalool Limonene.